I'm a fan of Jim Arnosky's science and nature picture books, which you may have guessed from my review of Thunder Birds last summer. What attracts me to Arnosky's books is his passion and sincere admiration for nature. He writes about what he notices in the world around him because he wants to share his love of nature with young readers. I didn't even have to "booktalk" Thunder Birds to my students last year. All I did was put the book on display and its magnificent illustrations and interesting facts sold itself to flocks of children. 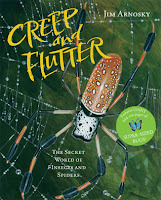 You can imagine my excitement when Arnosky's latest nonfiction picture book, Creep and Flutter, was released this year. This time Arnosky turns his attention to some of the most misunderstood and under-appreciated creatures on earth: insects and spiders. The author explains in the Introduction that he was inspired to write this book after observing and sketching a caterpillar on his farm. The book is divided into sections by insect families: beetles, caterpillars, butterflies & moths, etc... Arnosky writes about each group of insects or spiders by sharing anecdotes written in first person narrative while pencil sketches of the insects in the right margin provide readers with a closer look. He tell readers about a time when he was reading near the wood stove in his home when a beetle came crashing into a lampshade. Arnosky picked up the beetle and placed it under the microscope to get a better look. On the left side of the page are acrylic illustrations of super-sized beetles. Captions tell readers how much larger the beetles are compared with real life (ex: 5x actual size). The over-sized book has many fold-out pages that will fascinate readers. The beetle page opens to reveal colorful illustrations of over a dozen species of beetle. Silhouettes of insects are drawn to actual size. The writing on the color, fold-out pages shifts to a 3rd person expository style providing readers with facts about insects and spiders. 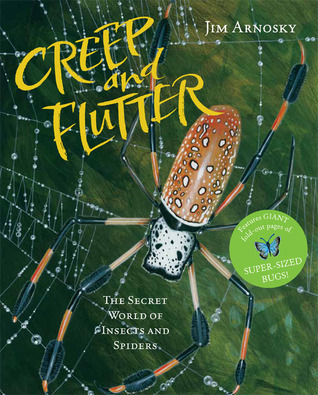 There is so much about this book that will attract children: the book design with the fold-out pages, the color and texture of the acrylic illustrations, and the engaging manner in which Arnosky writes about insects and spiders. The book will strike a chord with young nature enthusiasts and could be used by classroom teachers as a model for observing, writing and drawing about nature. In the back of the book is an extensive list of related books, such as The Hive Detectives by Loree Griffin Burns and Spiders by Nic Bishop, perfect for readers who want to learn more.